Directed by Mikhail Kalatozov. 1995. 143 min. Spanish with English subtitles. Produced by Mosfilm and ICAIC, this film was started only a week after the Cuban missile crisis and was designed to be Cuba’s answer to both Sergei Eisenstein’s propaganda masterpiece, Potemkin and Jean-Luc Godard’s freewheeling romance, Breathless. But I Am Cuba turned out to be something quite unique—a wildly schizophrenic celebration of Communist iconography, mixing Slavic solemnity with Latin sensuality. The plot, or rather plots, feverishly explore the seductive, decadent (and marvelously photogenic) world of Batista’s Cuba—deliriously juxtaposing images of rich Americans and bikini-clad beauties sipping cocktails poolside with scenes of ramshackle slums filled with hungry children and gaunt old people. Using wide-angle lenses that distort and magnify and filters that transform palm trees into giant white feathers, cinematographer Sergei Urusevsky’s acrobatic camera achieves wild gravity-defying angles as it glides effortlessly through long continuous shots. But I Am Cuba is not just a catalog of bravura technique—it also succeeds in exploring the innermost feelings of the characters and their often desperate situations. Shown unsubtitled at the San Francisco International Film Festival, I Am Cuba received two standing ovations. The first movie ever jointly presented by master filmmakers Martin Scorsese and Francis Ford Coppola, I Am Cuba is one of the great achievements of cinema. 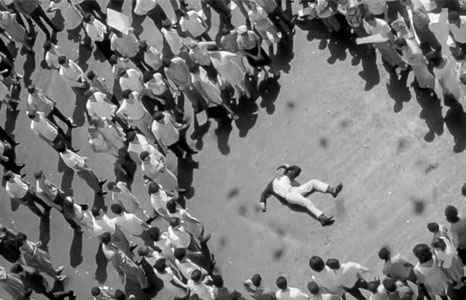 The newly-restored I Am Cuba is ravishing and surreal—the improved visuals and the single-language soundtrack allow viewers to experience the film’s extraordinary cinematography, sound editing, and narrative power. On Thursday, April 18 at 7pm, join us for a film introduction by Dr. Akiemi Glenn, Executive Director of The Pōpolo Project. On Friday, April 19 at 7pm, join us for a film introduction by Dr. Eric Thau, Associate Professor of Spanish and Latin American and Iberian Studies at UH Mānoa. Dr. Thau is a Hispanic film specialist who recently presented a paper on Pedro Almodovar's The Skin I Live In at Cine-Lit 9 at Portland State University. He is currently preparing an edited volume on biopics in Hispanic cinema. Read The AV Club review.